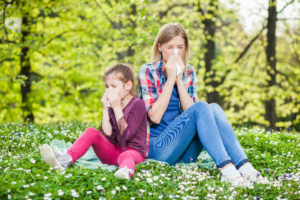 Allergens (pollens, weeds, chemical exposures, etc) sometimes stimulate the immune system to react, leading to symptoms like watery or itchy eyes, headaches, sneezing, nasal congestion or runny nose, and a sore throat. Allergic substances range from environmental exposures to chemical pollutants. Even tobacco exposure can contribute to nasal congestion. To treat allergies, most people need to reduce exposure to the allergen and/or take medications. Most medications including antihistamines, nasal decongestant or steroid sprays can be very effective in controlling the allergy symptoms. In some cases, allergy shots or drops (immunotherapy) may be needed to build up the body’s immune response to the allergen over time. Lafayette Pediatrics and Internal Medicine offers testing both for inhalant allergens as well as food allergens. For inhalant allergies, the most common method of testing we perform is known as skin prick testing. Allergen extracts are introduced through very tiny and superficial pricks in the skin, with minimal discomfort. The level of reactivity is then directly measured by the size of the skin welt that occurs at each test site. Most commonly, this is performed on the patient’s back. Our skin prick panel tests for 70 common environmental allergens including grasses, trees, weeds, molds and fungus, dust, and animal dander. Certain medications need to be avoided prior to skin testing. You should receive a list of medications to avoid when you schedule testing. Certain patients, especially those with poorly controlled asthma, those who have had a previous severe reaction to skin testing, and those who are unable to discontinue any of the medications listed, may undergo allergy testing via a blood test. This is an indirect test in that it measures antibodies in the blood rather than a direct reaction to the allergen, but it is a useful alternative to skin testing in these patients. Food allergy testing is conducted via a blood test. We have various panels available to test for both IgE-mediated food allergies as well as IgG-mediated food sensitivities. Testing for inhalant allergies helps guide treatment in several ways. For many patients it simply helps determine to what degree allergies may be playing a role in their symptoms. A remarkably negative allergy test in the face of significant symptoms can still be useful in that it directs additional testing and treatments toward other potential causes of these symptoms. Information about what substances are triggering a patient’s allergy symptoms can help the patient anticipate situations and seasons that may be especially bothersome. Efforts can be made to avoid these allergens, and medication can be started prior to times of high exposure as a prophylactic measure. Finally, the results of allergy testing guide individualized immunotherapy, which can desensitize a patient to the allergens and effectively cure the allergies. A very safe treatment that uses the patient’s own immune system to achieve results. The immune system is introduced to the allergen in small and increasing doses until natural immunity is developed. Currently considered off-label by the FDA, but uses the same safe and FDA-approved extracts used in traditional subcutaneous immunotherapy (allergy shots). Allergy symptoms may potentially begin to subside as early as 1-3 months following the beginning of treatment. Most patients notice an improvement within 6-12 months. The full treatment course is 4 years and the resulting relief can last many years, if not a lifetime. Healthcare Savings Accounts (HSA or Flex Spending) can be used to pay for expenses not covered by insurance. The allergy specialists at Lafayette Pediatrics and Internal Medicine are committed to providing collaborative, comprehensive care on an individual basis. Working in conjunction with the patient, our team of health care specialists provide in depth, modern health care for the well-being of the patient and their families. Does my health insurance cover SLIT? Insurance does typically cover all or some portion of allergy testing. However, most insurance plans do not pay for allergy drops at this time. Call your insurance company to discuss your benefits. Even though the drops are paid for out-of-pocket, there is still substantial cost savings with allergy drops compared to allergy shots. Because fewer office visits are required with allergy drops, you can expect significant cost savings on insurance co-pays, missed work and costs for travel time for clinic visits. What are the potential side effects from SLIT? These symptoms usually go away within thirty minutes after the drops are taken. All side-effects usually completely resolve within 1 week of starting the drops. If side effects seem more severe or last longer than 2 weeks, please contact our office right away. In the unlikely event that you have a severe reaction, call 911 or go to the nearest hospital emergency room right away. What are the benefits of SLIT, and when will I start to notice improvement? Often, symptoms decrease within a few weeks after starting allergy drops. However, it may take up to one year before you begin to notice improvement. Our goal is at least an 80% reduction in symptoms. Some patients experience 100% allergy relief, but most still experience some allergy symptoms that are less intense than before treatment. You can take your allergy drops in the privacy of your home. 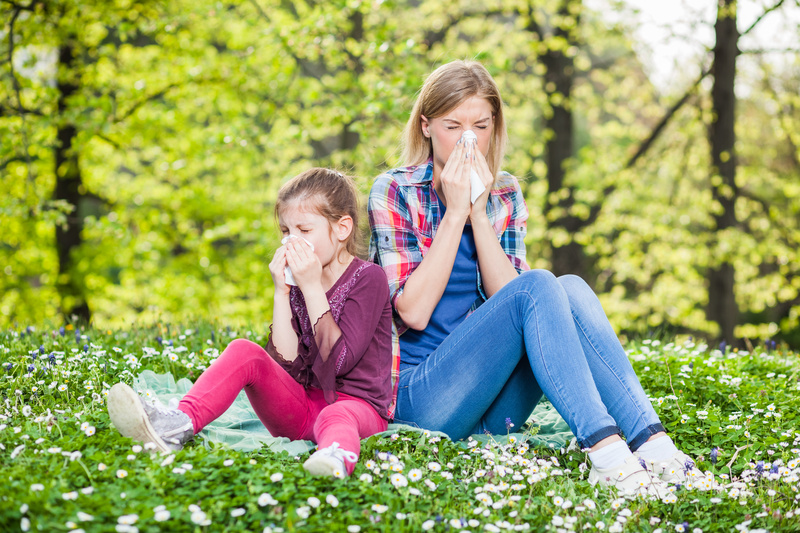 Compared to allergy shots, you do not have to worry about travel expenses or the cost of missed work/school/childcare due to frequent office visit requirements. Once stable on your drops, you can sign up for auto-refill to receive your drops every 3 months by mail. Once the 3-4 year treatment course is completed, you can expect long-term, even life-long reduction of your allergy symptoms. Your personal prescription for immunotherapy is prepared based on your unique allergy test results. Allergen extracts are prepared in our office by mixing them with a glycerin-saline solution. Drops are placed under the tongue daily. The concentration of allergen extracts is gradually increased every 3-4 weeks with a new bottle until you reach your maintenance dose. The drops contain no phenol or other toxins. Can I take allergy medications while I’m taking SLIT drops? Yes! Allergy medications do not interfere with allergy drops. In fact, allergy medications are often used in the early stages of allergy drops. However, your need for allergy medications should decrease during the course of your treatment. Yes! Allergy drops are safe and effective for children. They will appreciate not needing a shot, too! How do I know if I am a candidate for SLIT therapy? Allergy testing (skin prick testing and/or blood tests) is the first step to determine what you’re allergic to. Since both types of immunotherapy are effective, the decision between SLIT (drops) and SCIT (shots) often comes down to a question of safety, cost, and convenience. Our staff and providers are happy to counsel you to decide what is right for you and your family. I am coming in for allergy testing. What should I know? Please call ahead of time to get information on approximate cost and other significant information.